Each year, an estimated 500 billion to 1 trillion plastic bags are consumed worldwide. That amounts to roughly 1 million plastic bags utilized every minute. Plastic bags are made from polyethylene plastic, which is manufactured with large amounts of water + fossil fuels. They are not biodegradable, not widely recyclable in mainstream recycling facilities, and they are designed to last forever. 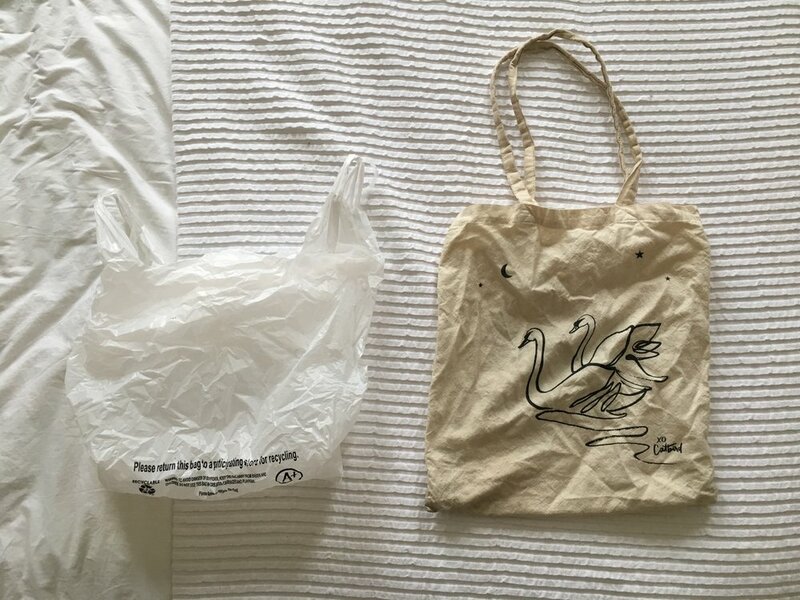 It takes about 1,000 years for a plastic bag to break down, and while it breaks down it releases micro plastic particles and leeches toxic chemicals into our soil, water + air. Plastic bags are detrimental to our resources, to our environments, to the ecosystems of animals, to animals, and to human beings. There is a simple solution! Refuse plastic bags, and carry a reusable bag with you. There are so many options now, and some stores even offer reusable bag credits. Some cities are even beginning to ban the use of plastic bags! Invest in a reusable bag, and refuse plastic bags. If you do have plastic bags lying around, or if they appear in your life, you can drop them in the designated plastic bag recycling bins are grocery stores or big box stores. These soft plastics are taken to specific facilities and turned into composite building materials, pellets, decking, etc. We live in a linear world, where infrastructure and commercial corporations manufacture products that are designed for single-use, only to end up in the waste. It's time for us to take this into our own hands, and attempt to create a circular economy and world. By utilizing a reusable bag, not only do we help the environment, but we vote with our action. The less plastic bags are utilized, the less will be manufactured, and the closer we are to saving the world, which is our goal here!